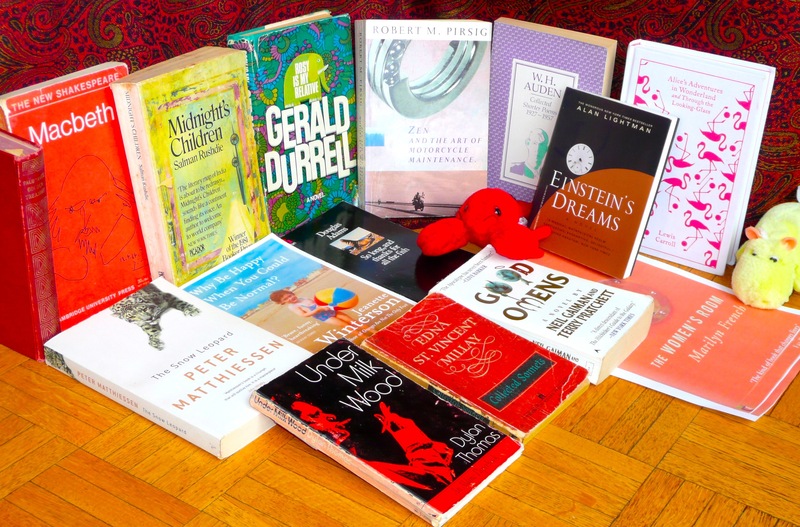 Here’s the mise en scène with my top 15 books–I know it was supposed to be 10, and believe me, I tried. The books I selected are the ones I love, and go back to often. Books that give me comfort, make me think, or simply make me laugh out loud. There were many more that didn’t make it to the photo: Thoreau’s On Walden Pond, Doris Lessing’s Golden Notebook, Ayn Rand’s Atlas Shrugged (an angry book, which helped me through a difficult time), Erica Jong’s Fear of Flying (a coming of age book for me; I’ve included Marilyn French’s The Women’s Room instead—in my late teens, it really changed the way I saw things), Catcher in the Rye and John Berger’s Ways of Seeing. Plus some wonderful novels: The Poisonwood Bible, Song of Solomon, The English Patient…. The list is endless. I guess I should let the picture speak for itself, but you know I’m not very good at doing that! The worn-out red hardback next to Macbeth is Palgrave’s Golden Treasury, which my brother and sister-in-law, Dalip and Nandini, gave me in 1971, and it hasn’t left my side since. I studied Macbeth in college and used to recite the speeches in the shower—my family thought I’d lost it! Einstein’s Dreams is a wonderful riff on the nature of time. Under Milk Wood is one of the most brilliantly written work that I have come across—Dylan uses words to conjure up images, sounds and moods in a way no one has ever done before. Or since. As for Midnight’s Children, I can still remember when it was published. Rushdie brought a blast of fresh air into Indian writing and changed it for good. Each of these books is wonderful in its own way, and more important, has been a friend through the years–most of them for a very long time, and some more recent, like Jeanette Winterston’s Why Be Happy When You Can Be Normal? And I know there will be more of these books over the years.